At the request of a wise photographer, I present MORE MONO CRITTERS! 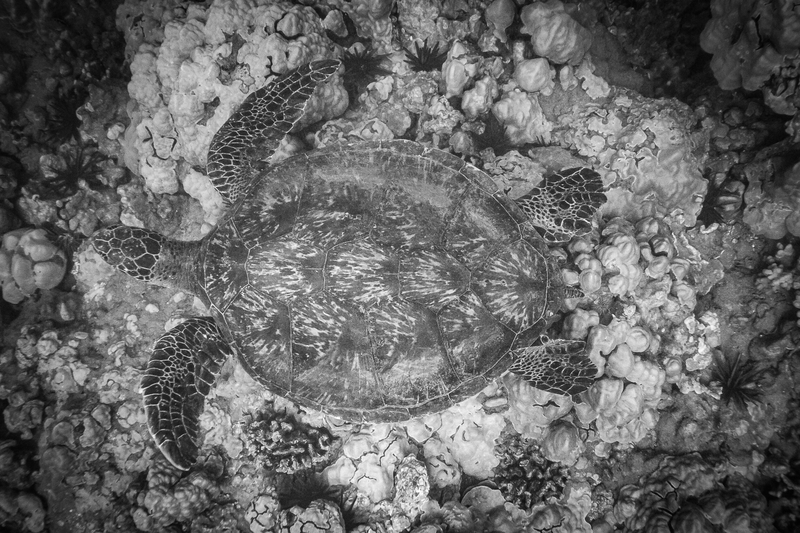 Today's share is a honu (Hawai'ian for 'turtle'), chilling out on the sea floor. The green sea turtle received such a name for the greenish tint in their flesh, caused by a diet of green algae that grows on the rocks and reefs. These guys spend all day bobbing around the ocean, nibbling delicious fresh algae, and curiously investigating snorkeling tourists. They have a relatively chill life, with little worry, other than the occasional hungry tiger shark. Found this one resting on the sea floor during a day off / snorkel photo session. This image was shot on a Canon 20D + EF 17-40 f/4 in an underwater housing. It's all older technology, and pretty much feels like swimming with a boat anchor, but it gets me in the water doing fun things. I know it's a little out of focus, and there's a bit of noise, but I still wanted to share it here. Cool. I don't think the focus is an issue, but it would be good if you could increase the contrast between the turtle and the background. Nice picture. As Richard said, a little contrast would help.